Mama Nibbles: #NaBloPoMo Challenge for June 1st - Jump! 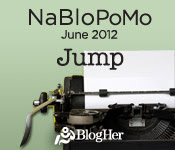 #NaBloPoMo Challenge for June 1st - Jump! What is the first thing that pops into your mind when you hear the word jump? Jump! That is how I live my life. When I find something I wish to do I just jump right in and learn how, no holds barred. There are so many things that I now know how to do that I never thought I would. I don't think that I could live my life happily without pushing the limits, making myself feel slightly uncomfortable or stretching my brain. That is precisely how Mama-Nibbles came to be. June 2000, my younger (middle) sister went to heaven. She was 16 and I was 18, she had not even gotten her drivers license yet. My sister was diagnosed in December of 1999 with a rare form of cancer that was growing in her brain. I cannot remember the name of the type but it was aggressive. My sister, best friend and partner in crime passed away just 6 months after the diagnosis, it was fast and sudden...totally unexpected. I wanted to literally "jump" out in front of a bus, I tried to go outside but family that was there kept me inside the hospital and would not let me leave. To them I am thankful because look at me now, married happily with three gorgeous children. Now I live my life as if every day could be my last. I love hard, I live strong and I laugh often. NO HOLDS BARRED, just JUMP! I love my sister, I feel her with me and I know I will see her one day in Heaven.